Bitsy baby looks super cute today in an Easter Chick costume. It’s the perfect outfit for going on an Easter egg hunt! 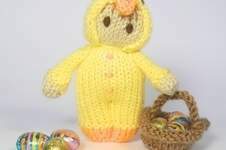 Bitsy has been lucky and found lots of eggs to put in her basket Bitsy doll bodies and heads are knitted in one piece and after seaming and stuffing the legs are created by sewing a seam through from front to back to divide the legs. The arms are knitted separately and are sewn on when making up these cute little characters. This pattern is suitable for confident beginners- All the doll and accessory pieces are knitted flat and use basic shaping.